Made of fine NBR rubber material has high resilience, proper mechanical strength and pliability. Stable property and easy to process and keep the precise size, this box of 0-rings can meet your various needs. Made of fine quality rubber material, these O-rings has good durability and longer service life. They are wearable, corrosion resistant and high temperature resistant. 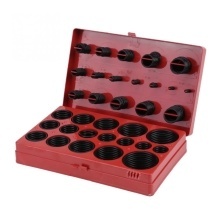 There are 32 different sizes of O-rings in this set that can meet your different need. Total 419 pieces so you do not have to worry about running out of O-rings for quite a while. They can be widely used for sealing for valves, cars, pumps, electrical equipment, bearings, etc.